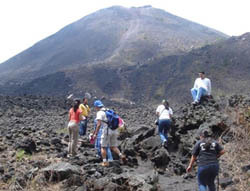 Since the National Park Cerro Verde reopened its doors to the public in December 2002 it offers visitors many new changes. The Ministry of Tourism has made a big effort together with the guides in order to provide of better quality services. They offer an interpretation of the environment in an educational and unique way. The guides are local people from the surrounding neighborhoods. Altitude: The Park is located at 2030 meters above sea level, in the western part of the country, between the departments of Santa Ana and Sonsonate. How to get there: Those traveling in their own vehicle take the road that from San Salvador takes you to Santa Ana, when you get to "El Congo" make a left or if coming from Sonsonate take the detour "Puerta Roja". By bus: Take the bus Ni 201 at the west terminal going to Santa Ana, then route 248 going to Cerro Verde. Currently the park can fill up to 300 people. For safety reasons the walks through the park and other pathways should be guided by local guides and/or tourism police officers.